Gen Nagai, winner of the National Golf Association of the Philippines’ Visayas Regional Amateur title, wins the national crown. GEN Nagai matched par 72 for the second straight day and completed a sizzling comeback to rule the Philippine Junior Amateur Championship presented by the MVP Sports Foundation at Sherwood Hills in Trece Martirez, Cavite. 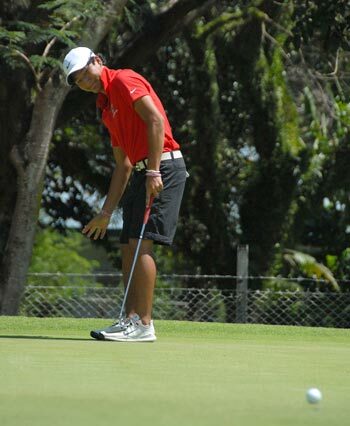 The 16-year-old Japanese, a Cebu resident who helped Cebu CC win the PAL Interclub two straight years from 2012, finished with a 301 total. Nagai won by an astounding eight shots over Gabriel Manotoc, who returned a 78, and the fading Raymart Tolentino, the three-day leader who imploded with an atrocious 84 for 309s. After birdies on Nos. 2 and 4 and a bogey on the ninth, Nagai already seized a four-stroke lead going into his inward nine to win the biggest event of his young career and keep the championship out of the hands of a Filipino. Park Min-ung of Korea triumphed last year, with Gio Gandiongco, also a former Cebu CC mainstay now in the United States on a golfing scholarship, the last homegrown bet to win in 2012. Diego San Pedro, the Fil-Canadian who has been impressive, also had a difficult final day, shooting an 81 to settle for fourth 10 shots behind with Aldric Chan shooting a 73 to catch Park at 313. The South Korean also ballooned to an 82. Kristopher Arevalo, the 13-14 age-group champion in the Callaway Junior Worlds last year, closed out with an 80 and finished at 318. He was pulled down by a second round 86 that left him too far back. Bianca Pagdanganan also authored a comeback in the girls’ division, closing out with a 75 to nip Harmie Constantino by three in the PLDT Group Amateur Tour event. Pagdanganan carved out a 38-37 effort for a 302, with Constantino, who held the lead after a third round of 73, shooting an 80 for 305 in the event also backed by Pancake House, Golf Depot and Pacsports. Daniela Uy finished with a 79 for 307, with Felicia Medalla shooting herself in the foot with a front nine 47 for an 88 that left her 21 strokes off the winning score. Indonesian Rivani Sihotang was the best-placed foreigner in the girls’ division at 321 after an 83.